You have to live Plan A-on any level. 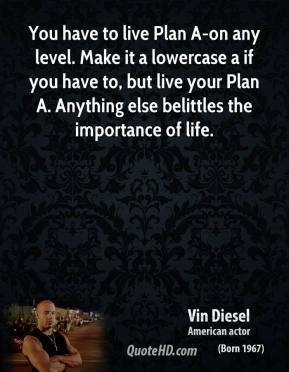 Make it a lowercase a if you have to, but live your Plan A. 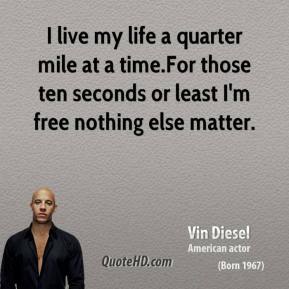 Anything else belittles the importance of life. 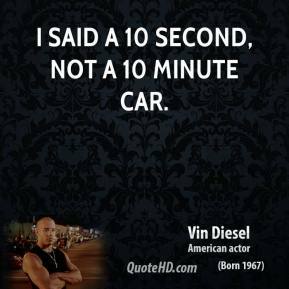 I said a 10 second, not a 10 minute car. What are you talking about? Are you sure you know what youre talking about? 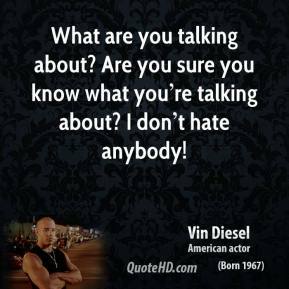 I dont hate anybody! 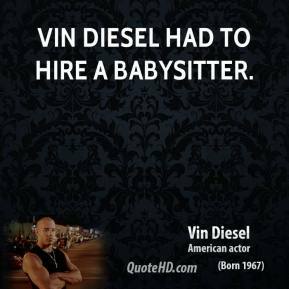 Vin Diesel had to hire a babysitter. 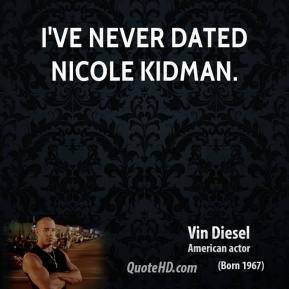 I've never dated Nicole Kidman. 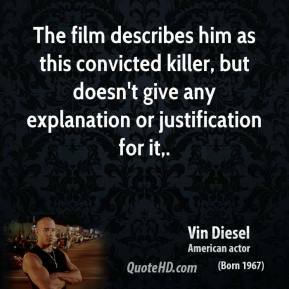 The film describes him as this convicted killer, but doesn't give any explanation or justification for it. 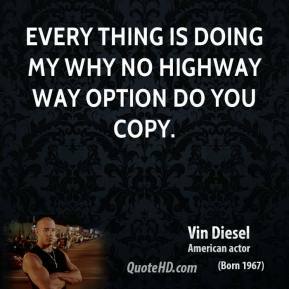 Every thing is doing my why no highway way option do you copy. 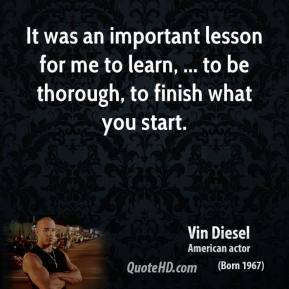 It was an important lesson for me to learn, ... to be thorough, to finish what you start. 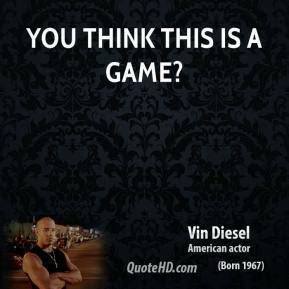 You think this is a game? ... 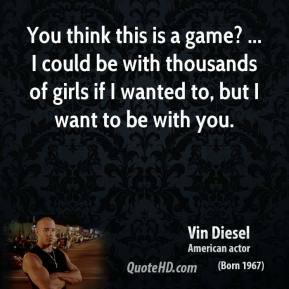 I could be with thousands of girls if I wanted to, but I want to be with you. 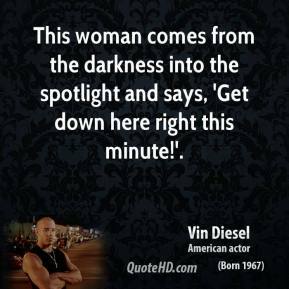 This woman comes from the darkness into the spotlight and says, 'Get down here right this minute!'. 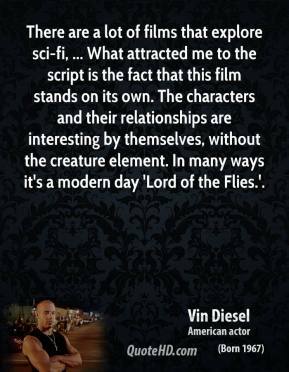 There are a lot of films that explore sci-fi, ... What attracted me to the script is the fact that this film stands on its own. The characters and their relationships are interesting by themselves, without the creature element. 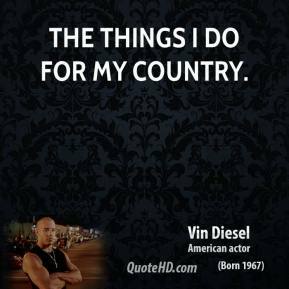 In many ways it's a modern day 'Lord of the Flies.'. With The Wheelman we have created the first integrated franchise being launched for both the gaming and film industries. 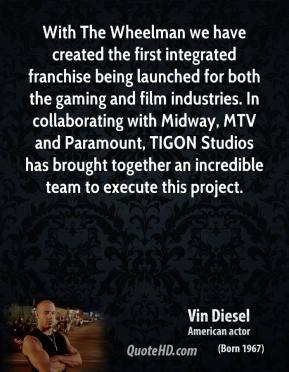 In collaborating with Midway, MTV and Paramount, TIGON Studios has brought together an incredible team to execute this project. 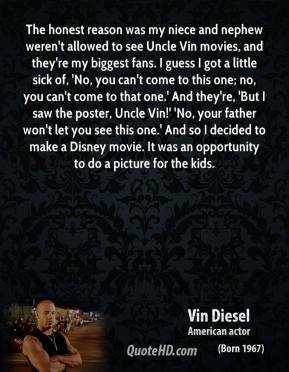 The honest reason was my niece and nephew weren't allowed to see Uncle Vin movies, and they're my biggest fans. I guess I got a little sick of, 'No, you can't come to this one; no, you can't come to that one.' 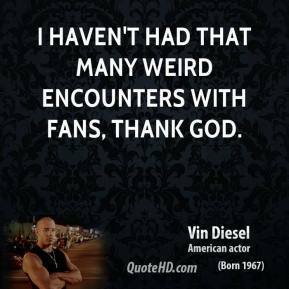 And they're, 'But I saw the poster, Uncle Vin!' 'No, your father won't let you see this one.' And so I decided to make a Disney movie. It was an opportunity to do a picture for the kids. I had spent my life studying these guys, looking up to them, watching their work. 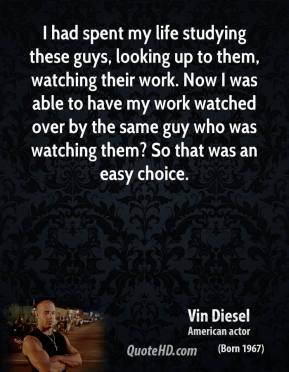 Now I was able to have my work watched over by the same guy who was watching them? So that was an easy choice. You can't say anything - you'll ruin me! 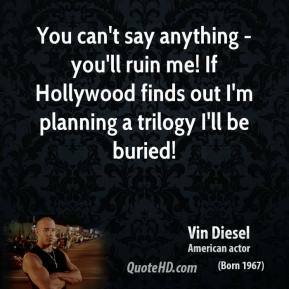 If Hollywood finds out I'm planning a trilogy I'll be buried! 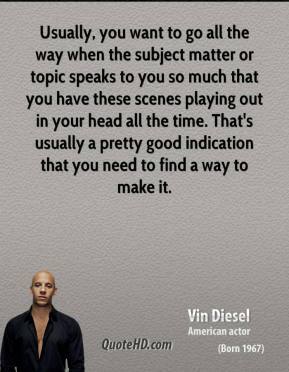 Usually, you want to go all the way when the subject matter or topic speaks to you so much that you have these scenes playing out in your head all the time. That's usually a pretty good indication that you need to find a way to make it. That was a dream. 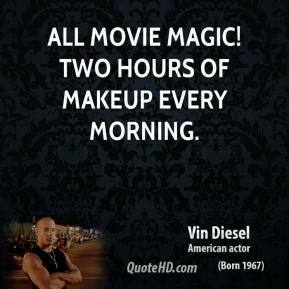 As an actor, you find yourself studying the performances of actors you've admired in the past, and so often those performances were in Sidney Lumet movies. 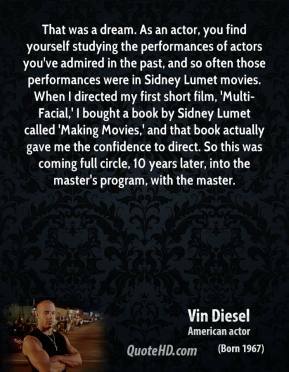 When I directed my first short film, 'Multi-Facial,' I bought a book by Sidney Lumet called 'Making Movies,' and that book actually gave me the confidence to direct. So this was coming full circle, 10 years later, into the master's program, with the master. I had never played a real-life character. 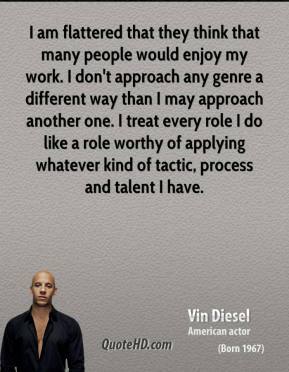 All the characters that I'd played before were fictitious. 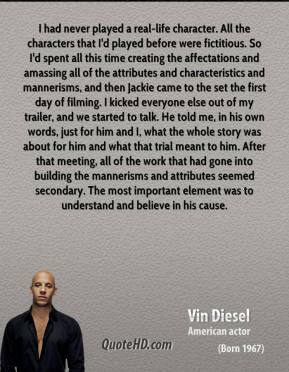 So I'd spent all this time creating the affectations and amassing all of the attributes and characteristics and mannerisms, and then Jackie came to the set the first day of filming. I kicked everyone else out of my trailer, and we started to talk. He told me, in his own words, just for him and I, what the whole story was about for him and what that trial meant to him. After that meeting, all of the work that had gone into building the mannerisms and attributes seemed secondary. 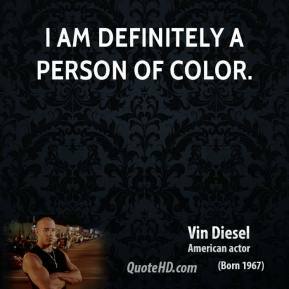 The most important element was to understand and believe in his cause.